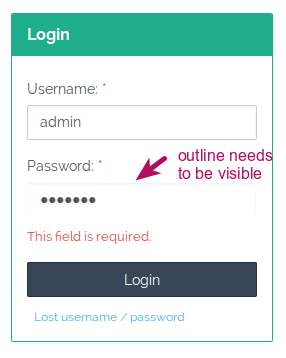 When the theme is Modern and the user types in the wrong username / password credentials on the login screen, the label for the password appears as white on white. It looks like the label is no longer there. Ghada, are you going to fix this? While the text is now readable in the patch, the outline of the password box is not yet. A very light outline is there once you clicked into the field, but none when it's not clicked yet. This still needs fixing in the patch. Bug #1579628: Fixed invisibible password label in theme "Modern"
could not be read because it was white on white in the "Modern" theme.